While Roux-en-Y gastric bypass (RNYGBP) is the most common bariatric procedure performed in the United States, vertical sleeve gastrectomy (VSG) is becoming the surgery of choice for both practitioners and patients, mainly because of the ease of surgery compared with gastric bypass and the elimination of bowel rearrangement and potential long-term complications. This continuing education course reviews the historical and current progression of VSG, its known mechanism of action, indications and contraindications for undergoing the procedure, and pre- and postoperative nutritional considerations. This course brings to the forefront the critical role nutrition plays in preventing or treating complications and suggests current, practical, and evidence-based dietary recommendations. With VSG, between 70% and 85% of the stomach along the greater curvature is removed. The pylorus is retained, and this is significant for allowing normal grinding and food bolus formation for duodenal entry (see Figures 1 and 2 below). The normal path of digestion and absorption isn’t disrupted with VSG compared with bariatric surgeries such as RNYGBP and BPD-DS. The sleeve resembles a long, thin, bananalike tube. A French bougie, the size of which varies depending on surgeon preference, is used to calibrate the sleeve size. Bougie sizes range from 32 to 60 French (F) and are believed to affect long-term weight loss capability. Depending on the bougie size, the resulting volume of food the sleeve can hold and process ranges from 90 to 220 mL. Bariatric surgery promotes weight loss through three mechanisms of action: food intake restriction (restrictive), calorie and nutrient malabsorption (malabsorptive), or a combination of both (combination). RNYGBP is a combination procedure, while BPD-DS, because of the dramatic resection of the intestines, is classified as a malabsorptive procedure. According to the surgical literature, VSG is considered a restrictive procedure because reduced stomach size causes early satiety and reduced oral intake.5 However, increasing evidence suggests that VSG induces weight loss through other physiological alterations, not just restriction, including increased intraluminal stomach pressure, which causes early satiety; increased gastric emptying for faster small-bowel transit time; and neurohormonal changes, including the reduction of both fasting and meal-stimulated ghrelin production and increased glucagonlike peptide-1 and peptide-YY, an intestinal hormone that increases satiety. Whereas normal stomach anatomy can hold approximately 1,500 mL, VSG reduces this volume to 90 to 220 mL.14 Yehoshua and colleagues assessed the stomach volumes and pressures of 20 patients who had undergone VSG and found that sleeve volumes held anywhere from 90 to 220 mL.15 When the sleeve was filled with a volume of saline, the pressure inside the sleeve rose to 43 mm Hg compared with 34 mm Hg when the stomach was intact. VSG reduces the stomach’s ability to distend, thereby increasing the amount of pressure within the intraluminal space. This increase in pressure leads to feeling of fullness and may lead to weight loss by reducing caloric intake. One interesting feature of VSG is most patients’ temporary absence of hunger following the procedure.16 The hypothalamus and gut hormones control hunger and satiety neurohormonally. While most gut hormones are considered anorectic because they suppress the appetite, ghrelin is known as the only orexigenic (appetite-stimulating) gut hormone.16 Ghrelin is produced primarily in the stomach but also in the duodenum, jejunum, and lung. Other studies have shown that ghrelin levels remain low even longer than six months postoperatively, aiding in the weight-loss process.18,19 Karamanakos and colleagues demonstrated that ghrelin reduction also concomitantly increased levels of peptide-YY.20 The interplay among the sleeve, ghrelin, and other hormones is complicated and not fully understood but is believed to play a major role in the weight-loss mechanism. The National Institutes of Health Consensus Development Panel established general guidelines and indications for bariatric surgery in 1991.24 General indication criteria for bariatric surgery includes patients who have a BMI higher than 40 or higher than 35 with high-risk comorbid conditions such as cardiopulmonary disease or uncontrolled type 2 diabetes, or physical problems that interfere with patients’ ability to participate in a healthful lifestyle, such as joint disease. Bariatric candidates also should have a documented history of unsuccessful weight loss through conventional means of diet therapy and exercise programs. While currently there’s no consensus on the contraindications, bariatric surgeons agree that bariatric surgery may not be advisable for patients who present with extremely high operative risks, actively engage in substance abuse, or present with major psychopathological conditions that would inhibit their understanding or comprehension of the nature of the surgery and need for life-long lifestyle changes. Indications and contraindications pertaining more specifically to VSG were suggested in the International Sleeve Gastrectomy Expert Panel Consensus Statement.13 Based on this statement, VSG is valid in the following cases: as a stand-alone or two-step procedure and option for high-risk patients, for liver and transplant candidates, for patients who are morbidly obese and have the metabolic syndrome or who have a BMI of 30 to 35 and comorbid conditions, for patients with inflammatory bowel disease, for elderly patients, and as a one-step revisional procedure from adjustable gastric band to VSG. The statement also notes that VSG is an absolute contraindication for patients with Barrett’s esophagus. RDs play an essential role in bariatric patients’ nutritional welfare by performing comprehensive nutrition assessments to identify, prevent, or correct deficiencies. Ideally, nutrition assessments should occur both pre- and postoperatively. Dietitians also continually educate their patients on appropriate foods and bariatric products, and they offer support and strategies to overcome dietary challenges. To help VSG patients, RDs should understand these patients’ specific nutrition concerns, as discussed below. Since obesity is a risk factor for developing nonalcoholic fatty liver disease (NAFLD), patients often are required to follow a “liver-shrinking diet” typically comprised of a high-protein, low-carbohydrate liquid diet with very few calories to reduce fatty liver and intra-abdominal fat before surgery. However, the liver-shrinking diet is difficult to follow because patients often feel hungry, may be nervous about the surgery, and experience emotional disconnect and grieving with the food restriction. An RD can offer support by suggesting strategies and appropriate beverages to get patients through this time period. One strategy, for example, is to change the textures of high-protein shakes and make them into high-protein ice cream or pudding. Merely changing the liquid to a soft texture makes the diet more palatable. The goal is to correct these deficiencies before surgery because they may be exacerbated after surgery as a result of poor oral intake and tolerance, noncompliance to a bariatric nutrition protocol, rigor of the protocol, absence of dietary guidance, inadequacy of food variety, and adherence to proton-pump inhibitors often prescribed for some time after surgery to reduce stomach acid, which can lead to malabsorption of B12 and iron. While research still is needed to evaluate the long-term effects of VSG on micronutrient status, vitamin and mineral deficiencies after the procedure are reported up to five years post-op. Dumping syndrome is more commonly seen with gastric bypass and caused by rapid emptying of simple carbohydrates into the jejunum-ileum, which leads patients to experience watery diarrhea, diaphoresis (extreme sweating), episodic hypoglycemia, abdominal pain, bloating, stomach rumbling, tachycardia, flushing, and nausea. The syndrome is categorized into early or late, depending on when symptoms begin and their severity. Typically, signs of early dumping syndrome include gastrointestinal upset, diarrhea, bloating, sweating, palpitations, and dizziness. Late dumping syndrome generally includes hypoglycemia, fainting, confusion, and excessive hunger. At one time, dumping syndrome wasn’t believed to occur with VSG because the duodenum remained intact. However, Tzovaras and colleagues demonstrated that VSG patients, when given an oral glucose challenge, can experience clinical symptoms of early or late dumping syndrome characterized by hypoglycemia, nausea, diaphoresis, and fainting.39 Therefore, patients should be educated about avoiding an excessive intake of simple sugars after surgery. Interestingly, while VSG is dramatically different than gastric bypass and adjustable band surgery in terms of the procedure itself, patients who undergo VSG experience similar postoperative symptoms of nausea, vomiting, diarrhea, dehydration, gas, lactose intolerance, electrolyte imbalance, food aversions, and sensory enhancement. The dietitian plays an integral role in identifying symptoms that may be related more to the surgical risks than to dietary consequences. For example, gastric leak, gastric ulcer, and gastric stricture are serious sleeve-associated risks that initially may present as dehydration, abdominal and back pain, fever, nausea, vomiting, and anemia. The dietitian may be the first health care professional who recognizes these symptoms, which reinforces the importance of having an interdisciplinary health care team for the bariatric surgery patient. To date, there’s no single, standardized bariatric diet. However, there are several published bariatric nutrition practice guidelines available for RDs who counsel patients who have undergone bariatric surgery. The ASMBS has published the ASMBS Allied Health Nutritional Guidelines for the Surgical Weight Loss Patient.41 Unfortunately, the guidelines don’t provide specific recommendations for VSG per se, and these guidelines currently are under review for revision. Programs that use the ASMBS guidelines consider VSG to be a restrictive procedure and may follow the recommendations listed for them. The most recent evidence-based recommendations for VSG come from a collaboration of the American Association of Clinical Endocrinologists, the Obesity Society, and the ASMBS. In their 2013 update of the Clinical Practice Guidelines for the Perioperative Nutritional, Metabolic, and Nonsurgical Support of the Bariatric Surgery Patient, recommendations are made for some macro- and micronutrients appropriate for VSG patients.43 The suggested nutrition recommendations are minimal, though, and each patient should be assessed individually for more specific needs. The recommendations, which provide general information about early postoperative nutrition and micronutrients specifically for VSG, are summarized in Table 3. Patients who have undergone VSG should be encouraged to participate in regular follow-up visits with their interdisciplinary bariatric team. For each patient, an RD should perform a comprehensive nutrition assessment to identify, prevent, or correct deficiencies. Preoperative education as well as postoperative reinforcement of bariatric protocol is paramount for VSG patients’ long-term success. Education and counseling should focus on supporting and teaching patients about meaningful lifestyle changes and correcting the misperception that bariatric surgery is a quick fix or magic bullet. VSG is the fastest-growing bariatric surgical procedure worldwide. The procedure’s durability is contingent on positive patient outcomes. The RD, as an integral member of an interdisciplinary bariatric health team, plays an important role in identifying, preventing, and correcting nutritional challenges before and after VSG. While long-term research is needed to elucidate the evidence-based practice most appropriate for dietary counseling with VSG patients, dietitians should consider participating in research that reports findings and validates nutrition recommendations. VSG is a unique procedure set apart from other bariatric procedures, such as gastric bypass, the adjustable band, and BPD-DS. RDs should encourage patients who have undergone any type of bariatric surgery to obtain postoperative follow-up care with their interdisciplinary bariatric teams. RDs educated in bariatric nutrition should continue to be at the forefront of care for these patients and perform comprehensive nutrition assessments to provide medical nutrition therapy based on patients’ specific individual micro- and macronutrient needs. As the number of VSG surgeries increases each year, and coupled with the lack of long-term evidence on the efficacy of the procedure, providing proper nutrition advice to patients becomes even more critical. With a lack of consensus or standardization of bariatric nutrition guidelines for VSG, a patient-centered approach to care using all available guidelines combined with a dietitian’s expertise can prove most advantageous for successfully helping patients through their bariatric journeys. — Lillian Craggs-Dino, DHA, RDN, LDN, is a practicing bariatric dietitian, support group coordinator for a renowned bariatric program in south Florida, national and international speaker, and freelance food and nutrition writer. 1. Describe the history of vertical sleeve gastrectomy (VSG) as a stand-alone bariatric procedure and distinguish its mechanism of action and efficacy. 2. Identify potential nutritional deficiencies that result from undergoing the procedure. 3. 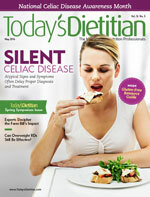 Apply current practice nutrition guidelines to direct dietary counseling. 4. Demonstrate the importance and role of the dietitian in VSG’s durability and success. 1. Vertical sleeve gastrectomy (VSG) as a stand-alone bariatric procedure first began as which of the following? a. It was the second step in a Roux-en-Y gastric bypass for patients who were super morbidly obese. b. VSG always was considered a stand-alone bariatric procedure. 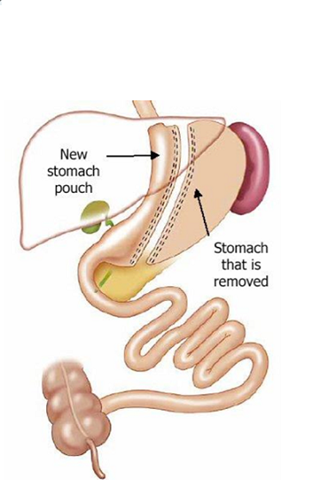 c. It was the first step in a two-step bariatric procedure called biliopancreatic diversion with duodenal switch. d. It was the first step in a two-step bariatric procedure called vertical banded gastroplasty. 2. Which appetite-stimulating hormone decreases following VSG? 3. Which of the following is the key aspect of the mechanism of action by which VSG induces weight loss? a. It is a restrictive procedure that reduces stomach capacity to approximately 90 to 220 mL and decreases the amount of food intake. b. It causes calorie and vitamin malabsorption by disrupting how food flows from the stomach to the intestines. c. It reduces gastric emptying. d. It causes an increase in hunger by increasing ghrelin production. 4. Wernicke-Korsakoff syndrome has been reported in VSG patients. This syndrome is caused by a deficiency of which vitamin? 5. Which of the following groups of patients aren’t eligible for VSG? 6. When and for what purpose is the liver-shrinking diet recommended? 7. VSG significantly reduces intrinsic factor and therefore would directly affect the absorption of which of the following? 8. Weight-loss success after VSG is calculated based on which of the following? 9. Which form of calcium is recommended after VSG? 10. According to the most recently proposed dietary guidelines, how many meals per day are recommended for VSG patients? 1. Obesity and overweight. World Health Organization website. http://www.who.int/mediacentre/factsheets/fs311/en/index.html. Updated March 2013. Accessed May 15, 2013. 2. Adult obesity facts. Centers for Disease Control and Prevention website. http://www.cdc.gov/obesity/data/adult.html. Last updated August 16, 2013. Accessed May 15, 2013. 3. ASMBS position statement: bariatric surgery in class 1 obesity (BMI 30-35kg/m2). American Society for Metabolic & Bariatric Surgery website. http://asmbs.org/2012/09/bariatric-surgery-in-class-1-obesity-bmi-30-35-kgm2/. Updated September 7, 2012. 4. Batsis JA, Sarr MG, Collazo-Clavell ML, et al. Cardiovascular risk after bariatric surgery for obesity. Am J Cardiol. 2008;102(7):930-937. 5. Saber AA, Elgamal MH, McLeod MK. Bariatric surgery: the past, present, and future. Obes Surg. 2008;18(1):121-128. 6. Trelles N, Gagner M. Sleeve gastrectomy. Op Tech Gen Sur. 2007;123-131. 7. Abu-Jaish W, Rosenthal RJ. Sleeve gastrectomy: a new surgical approach for morbid obesity. Expert Rev Gastroenterol Hepatol. 2010;4(1):101-119. 8. ASMBS Clinical Issues Committee. Updated position statement on sleeve gastrectomy as a bariatric procedure. Surg Obes Relat Dis. 2012;8(3):e21-e26. SearchType=And&where=index&nca_id=2. June 27, 2012. Accessed May 20, 2013. 10. Johnston D, Dachtler J, Sue-Ling HM, King RF, Martin IG. The Magenstrasse and Mill operation for morbid obesity. Obes Surg. 2003;13(1):10-16. 11. Weiner RA, Weiner S, Pomhoff I, Jacobi C, Makarewicz W, Weigand G. Laparoscopic sleeve gastrectomy-influence of sleeve size and resected gastric volume. Obes Surg. 2007;17(10):1297-1305. 12. Parikh M, Gagner M, Heacock L, Strain G, Dakin G, Pomp A. Laparoscopic sleeve gastrectomy: does bougie size affect mean %EWL? Short-term outcomes. Surg Obes Relat Dis. 2008;4(4):528-533. 13. Rosenthal R; International Sleeve Gastronomy Expert Panel. International sleeve gastrectomy expert panel consensus statement: best practice guidelines based on experience of >12,000 cases. Surg Obes Relat Dis. 2012;8(1):8-19. 14. Melissas J, Koukouraki S, Askoxylakis J, et al. 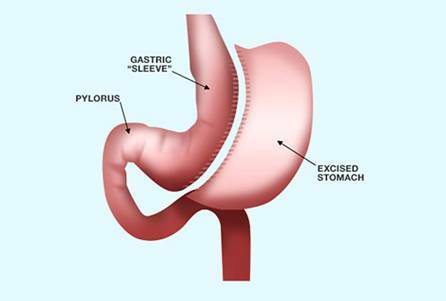 Sleeve gastrectomy: a restrictive procedure? Obes Surg. 2007;17(1):57-62. 15. Yehoshua RT, Eidelman LA, Stein M, et al. Laparoscopic sleeve gastrectomy—volume and pressure assessment. Obes Surg. 2008;18(9):1083-1088. 16. Chaudhri OB, Wynne K, Bloom SR. Can gut hormones control appetite and prevent obesity? Diabetes Care. 2008;31 Suppl 2:S284-S289. 17. Papailiou J, Albanopoulos K, Toutouzas KG, Tsigris C, Nikiteas N, Zografos G. Morbid obesity and the sleeve gastrectomy: how does it work? Obes Surg. 2010;20(10):1448-1455. 18. Langer FB, Reza Hoda MS, Bohdjalian A, et al. Sleeve gastrectomy and gastric banding: effects on plasma ghrelin levels. Obes Surg. 2005;15(7):1024-1029. 19. Wang Y, Liu J. Plasma ghrelin modulation in gastric band operation and sleeve gastrectomy. Obes Surg. 2009;19(3):357-362. 20. Karamanakos SN, Jagenas K, Kalfarentzos F, Alexandrides TK. Weight loss, appetite suppression, and changes in fasting and postprandial ghrelin and peptide-yy levels after roux-en-y gastric bypass and sleeve gastrectomy: a prospective, double blind study. Ann Surg. 2008;247(3):401-407. 21. Keren D, Matter I, Rainis T, Lavy A. Getting the most from the sleeve: the importance of post-operative follow-up. Obes Surg. 2011;21(12):1887-1893. 22. Deitel M, Gagner M, Erickson AL, Crosby RD. Third international summit: current status of sleeve gastrectomy. Surg Obes Relat Dis. 2011;7(6):749-759. 23. Hutter MM, Schirmer BD, Jones DB, et al. First report from the American College of Surgeons-Bariatric Surgery Center Network: laparoscopic sleeve gastrectomy has morbidity and effectiveness positioned between the band and the bypass. Ann Surg. 2011;254(3):410-422. 24. Buchwald H; Consensus Conference Panel. Consensus conference statement bariatric surgery for morbid obesity: health implications for patients, health professionals, and third-party payers. Surg Obes Relat Dis. 2005;1(3):371-381. 25. Kakoulidis TP, Karringer A, Gloaguen T, Arvidsson D. Initial results with sleeve gastrectomy for patients with class I obesity (BMI 30-35 kg/m2). Surg Obes Relat Dis. 2009;5(4):425-428. 26. Himpens J, Dobbeleir J, Peeters G. Long-term results of laparoscopic sleeve gastrectomy for obesity. Ann Surg. 2010;252(2):319-324. 27. Lewis MC, Phillips ML, Slavotinek JP, Kow L, Thompson CH, Toouli J. Change in liver size and fat content after treatment with Optifast very low calorie diet. Obes Surg. 2006;16(6):697-701. 28. Colles SL, Dixon JB, Marks P, Strauss BJ, O’Brien PE. Preoperative weight loss with a very-low-energy diet: quantitation of changes in liver and abdominal fat by serial imaging. Am J Clin Nutr. 2006;84(2):304-311. 29. Kaider-Person O, Person B, Szomstein S, Rosenthal RJ. Nutritional deficiencies in morbidly obese patients: a new form of malnutrition. Part B: minerals. Obes Surg. 2008;18(8):1028-1034. 30. Damms-Machado A, Friedrich A, Kramer KM, et al. Pre- and postoperative nutritional deficiencies in obese patients undergoing laparoscopic sleeve gastrectomy. Obes Surg. 2012;22(6):881-889. 31. Hakeam HA, O’Regan PJ, Salem AM, Bamehriz FY, Eldali AM. Impact of laparoscopic sleeve gastrectomy on iron indices: 1 year follow-up. Obes Surg. 2009;19(11):1491-1496. 32. Gehrer S, Kern B, Peters T, Christoffel-Courtin C, Peterli R. Fewer nutrient deficiencies after laparoscopic sleeve gastrectomy (LSG) than after laparoscopic roux-y-gastric bypass (LRYGB): a prospective study. Obes Surg. 2010;20(4):447-453. 33. Capoccia D, Coccia F, Paradiso F, et al. Laparoscopic gastric sleeve and micronutrients supplementation: our experience. J Obes. 2012;2012:672162. 34. Aarts EO, Janssen IM, Berends FJ. The gastric sleeve: losing weight as fast as micronutrients? Obes Surg. 2011;21(2):207-211. 35. Makarewicz W, Kaska L, Kobiela J, et al. Wenicke’s syndrome after sleeve gastrectomy. Obes Surg. 2007;17(5):704-706. 36. Scarano V, Milone M, Di Minno MN, et al. Late micronutrient deficiency and neurological dysfunction after laparoscopic sleeve gastrectomy: a case report. Eur J Clin Nutr. 2012;66(5):645-647. 37. Jeong HJ, Park JW, Kim YJ, Lee YG, Jang YW, Seo JW. Wernicke’s encephalopathy after sleeve gastrectomy for morbid obesity: a case report. Ann Rehabil Med. 2011;35(4):583-586. 38. Moizé V, Andreu A, Flores L, et al. Long-term dietary intake and nutritional deficiencies following sleeve gastrectomy or roux-en-y gastric bypass in a Mediterranean population. J Acad Nutr Diet. 2013;113(3):400-410. 39. Tzovaras G, Papamargaritis D, Sioka E, et al. Symptoms suggestive of dumping syndrome alter provocation in patients alter laparoscopic sleeve gastrectomy. Obes Surg. 2012;22(1):23-28. 40. Melissas J, Daskalakis M, Koukouraki S, et al. Sleeve gastrectomy: a “food limiting” operation. Obes Surg. 2008;18(10):1251-1256. 41. Allied Health Sciences Section Ad Hoc Nutrition Committee, Aills L, Blankenship J, Buffington C, Furtado M, Parrott J. ASMBS allied health nutritional guidelines for the surgical weight loss patient. Surg Obes Relat Dis. 2008;4(5 Suppl):S73-S108. 42. Snyder-Marlowe G, Taylor D, Lenhard MJ. Nutrition care for patients undergoing laparoscopic sleeve gastrectomy for weight loss. J Am Diet Assoc. 2010;110(4):600-607. 43. Mechanick JI, Youdim A, Jones DB, et al. Clinical practice guidelines for the perioperative nutritional, metabolic, and nonsurgical support of the bariatric patient—2013 update: cosponsored by American Association of Clinical Endocrinologists, the Obesity Society, and American Society for Metabolic & Bariatric Surgery. Obesity (Silver Spring). 2013;21 Suppl 1:S1-S27. 44. Wardé-Kamar J, Rogers M, Flancbaum L, Laferrere B. Calorie intake and meal patterns up to 4 years after roux-en-y gastric bypass surgery. Obes Surg. 2004;14(8):1070-1079.